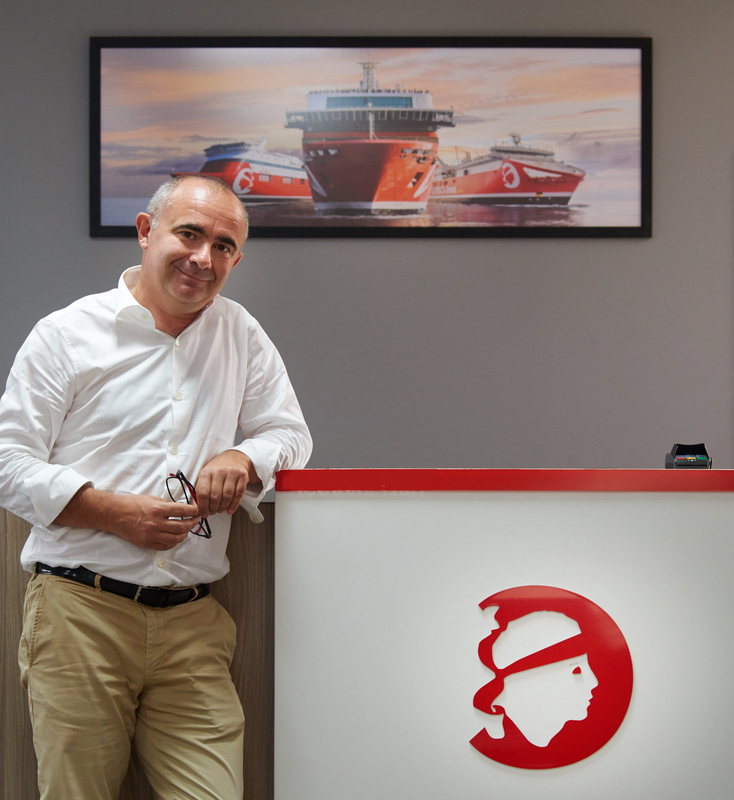 Last week I had an appointment with Pierre-Antoine Villanova, the CEO of Corsica Linea. I had the choice to meet him either in Marseille or Ajaccio. The latter it became, and when I presented myself at the reception of the ferry terminal, a friendly staff member told me I had to go to another building, nearby. Much to my surprise he was so kind to accompany me to show where it was. This devotion was something I wasn’t expecting. Mr Villanova was not sitting in a huge office. Actually, my office at home is probably larger than his. What a change, compared with the Marseille-based SNCM headquarters, which I remembered from a dozen of years ago. Visiting the big boss at that time was like visiting a king. Mr Villanova, I don’t want to mention SNCM too much. One thing I can say is that the unfolding of this drama, and the consequent resurrection, was difficult to follow from our position in northern Europe. The only perception I have now is that things are going quite well. When did Corsica Linea start? On 6 January 2016 we were in the Tribunal of Marseille, to take over a part of the assets of SNCM and 850 staff. How does France look upon the new Corsican ferry connection? Is it still based upon the disastrous last years of SNCM, with strikes etc? No, in France this is forgotten. We have one big advantage. Many Corsican inhabitants are now seeing us as their regional company. There is a certain awareness of attachment, which secures our company for a couple of years. They identify themselves to us. They want us to be successful. SNCM was a heavy machine, with debts and political fights. I guess there was no way this company could have escaped from this deep crevasse? With the State as main shareholder, and bad management, and the unions having taken the company in a stranglehold, it was impossible indeed. How did you make the transition from this jeopardized company to a new, fresh ferry operator? I have totally erased the political element in my reasoning. I have just put the entrepreneurial common sense on the table. I always say that, “We are a start-up in the body of a grandma.” The ships were old, and the mentality was totally distorted. I do not have a boat license. I do not have a maritime background. However, my expertise is the restructuration of businesses. I worked for big French companies where I was asked to restructure certain divisions, which were in difficulties. Corsica Linea’s shareholders were looking for a real entrepreneur, capable of creating a new dynamic wave. They also needed somebody who understood them. We have started this company without looking too much in the past. Looking forward was the only thing I wanted to do. We had a very clear view on how we wanted to handle this. First, we said we are not here to stay two years, make money and leave. Second, we are not a big company. We are not part of a huge French group. People need to realize that for us it is a lifetime project. It is our money, it is us. Involving the staff must have been a revolution for those coming from SNCM? It was a huge change in company culture. For example, the crew was surprised to see the boss coming on board. They hadn’t seen that before. The former bosses were rather afraid to go on the ferries. I shake hands, I talk, I listen. And if I don’t agree, I tell them. An anecdote: a few weeks after the start I took the ferry on a Sunday evening in June, to go to Marseille. I was not shaven (I never do in weekends) and in shorts. I went to the reception to get my cabin key. A young woman, with a temporary contract, didn’t know me. She asked my name and I just said my surname, Villanova. “Which Villanova?” she asked. “I am the boss of the company.” She looked at me and said, “Sir, a boss doesn’t look like this.” The purser rushed in our direction to save the situation. I like it this way. It is a more human approach, more efficient, Instead of being untouchable in some kind of ivory tower. I might never wear a tie but the bankers know what I am doing. On what basic ideas did you get started? Our centring thought was to put the customer in the middle of everything. Not in an artificial way, as some large companies do. Customer satisfaction is of paramount importance. I would describe my method as a mix of Harvard Business School and Corsican culture (a bit old-fashioned). When we could do 100, I promised 80. And we did 120. Slowly the confidence grew, both amongst customers and crew. We also took some actions, which immediately created a snowball effect. Quickly painting the ships in red was symbolic. It meant the past was over. It is a group of 15 shareholders, all of them active in transport, logistics and freight handling. 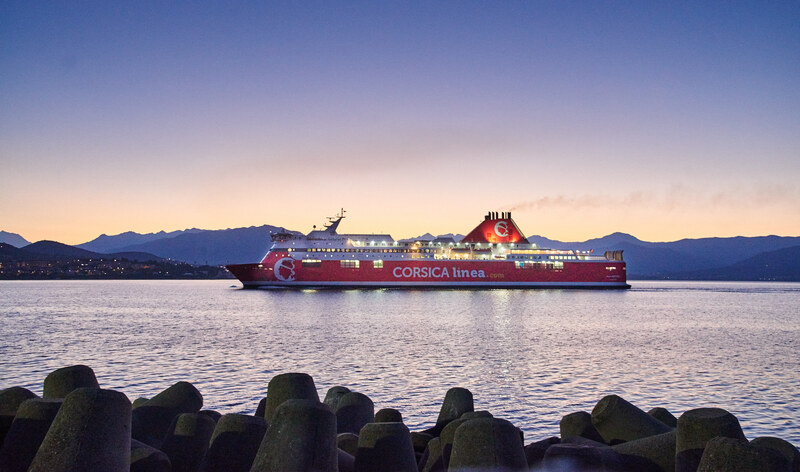 Their goal was to have a performing and reliable ferry service between Corsica and continental France. Together we have done it with an entrepreneurial mind. My shareholders are here for the long term. They asked me to create a new company and said to evaluate it in ten years. They give me enough time to build up properly. You might have this entrepreneurial spirit, but still you needed to motivate seafarers and staff (with many coming from SNCM). There was a huge knowhow in the company, but the people were so tired. We were able to switch on the light again, by clearly explaining our ideas. Can you define your customers? We have three main customers: freight, passengers and the OTC (Office des Transports de la Corse). The OTC is the emanation of the Corsican Assembly, the unicameral legislative body of the territorial collectivity of Corsica. It is the OTC who decides what kind of Public Service is needed. Is it pax only, freight only, or a mix? OTC evaluates and decides. You are now at the start of your third year. How does the company look like? Freight is healthy. The passengers are back and our company is in good shape. Now we are entering the second phase of our development. We need to be sustainable, both economically and environmentally.And we also have to act responsibly, socially and environmentally. 1) Being a socially respectable company. We do not want to be a low-cost. I want to keep using French seafarers, which is by the way three times as expensive as Italian seafarers. 3) Being respectful for the environment. We just announced that three ships will be connected to shore power in Marseille. And the day we are having a new ferry, it will be LNG-powered. We will be ready for the environmental mutation of the company. If you say Corsica or Marseille, do you really mean both sides? Yes. Our company is not a company based in Marseille, doing business with Corsica. We are a company with two anchor points. I live here (Corsica) but every week I am 2-3 days in Marseille. In the beginning people were anxious about us running the company against Marseille. No way! Our ambition is to be leader on the freight side. On the passenger side we’ll never be leader. But we consider the mix of freight and PAX in ro-pax ships is the right mix for Mediterranean islands as it is in Sardinia and the Balearic Islands. Where did you acquire your expertise to handle this start-up? For 20 years I worked for the Suez Group, and that’s where I acquired the tools you need to create changes. I just had to install them in a smaller, human-scaled company, what we call an ETI (Entreprise à Taille Intermédiaire, medium-sized company). In the transition from state-owned company to start-up, you must have torn down many traditions? We ripped down many ‘codes’. For example, I tore down the code of seniority, which was a tradition. You might have been 100 times better than your older colleague, but he would be promoted, because of the number of years. That was nonsense. Our fleet manager is a second engineer. He was not chief engineer. It is a guy with the spirit of an entrepreneur and was willing to get started. In the beginning there was some reluctance. Now he’s a driving force within the company. It must not have been easy to change such traditions? Does it make any sense? No! I don’t want to have to explain within three years why I killed my company. All those young people have always been there, wanting to give the best of themselves. Well, now they want it even harder. I operate the same way as 90% of successful companies in the world do. If you change systems as seniority, what do the people get in place? 80% of them get more motivated as they know their team spirit and their commitment to the success of the company is the number one in their career management. We also implemented the French “L’intéressement et la Participation” is a system which allows to redistribute to employees a part of the profits made by their company. It is a very simple technique to motivate staff to reach certain goals. I understand that the new Delegation of Public Service (DSP) will first get a test phase? Indeed. Recently the OTC decided to test the DSP for 15 months, before launching a 10-year contract. The centre of the DSP is the freight, and a bit of pax only. It is being tendered, so I am not allowed to speak about it. The deadline for tendering is beginning of November. In April next year the decision will be taken to know who will have to operate under the DSP for 15 months. The DSP supports the operator financially but it creates constraints too? 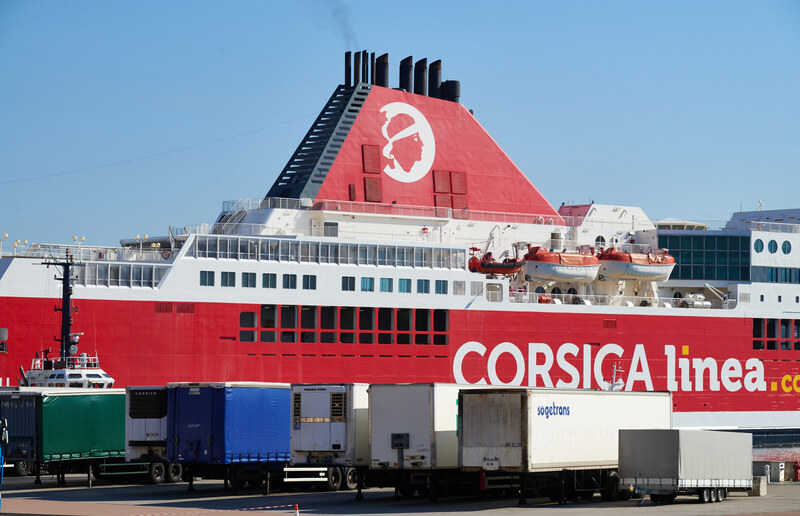 Corsica puts a number of constraints on the freight, passengers, timetable, frequencies. For example three times a week I have to go to one of the secondary ports (Ile Rousse, Propriano and Porto Vecchio). If you go to Porto Vecchio in winter, you won’t have a lot of people on this crossing! The ships have to remain in port during the day. There’s logic. A truck arrives by ferry in Marseille in the morning. It goes to one of the logistic centres in the neighbourhood, goes back to the port around 13:00. On 15:00 it is being driven on board. Departure is at 19:00 departure and at 06:30 the ferry arrives in Corsica. At 08:00 the truck is at the supermarket of Ajaccio etc. Can you say something about this plan to create a regional ferry company? The Assemblée de Corse had the idea to start a regional company. They wanted to buy two ro-paxes, MONTE D’ORO and PAGLA ORBA. They changed their mind, as that the two ferries were not up to the environmental standards. What their next plan is, I don’t know. We charter the VIZZAVONA and more is yet to come. For new routes you need ships. We are developing Sardinia and we will do more on Algeria next winter. Before doing anything else we need to go through an investment phase of our fleet. We worked hard on the digitalisation of our booking system. We were at Version 10 and now at Version 23. It took one year, and then, in one night it was operational. We also have a new freight-booking engine, with a better interface. The next step is to enhance the digital connection with the ferries. How was the (touristic) summer? Good, we were +6% in July-August. Allow me to add that we were up 15% in the first six months. We see that the ferry’s main competitor is the plane. Air travel to Corsica is increasing. But pax is not our core business. How does Mr Villanova feel after these two intense years? I still don’t have my boating license but that’s what we are doing: being “entrepreneurs”. Thank you for this interview and, bonne chance!